About JP Concrete Creations. Inc.
JP Concrete Creations, Inc. is a family owned and operated smaller company with 15 years experience. Artist James Peters who is the owner and designer who creates beautiful concrete staining that will last and be admired for years to come. At times hiring and working with a larger company, details can be over looked that is why we have committed to staying small and keeping everything in the family for the consumers benefit. James is on every job site from start to finish to insure a stunning result and is happy to assist you with color and design selections, if you should need a little help. Please call Laura today to set up a time and day for your free estimate and design. 770 590-8955. Advances in concrete, stain and sealant technology have allowed us to expand our services to include environmentally friendly, water-based and water-reducible coatings. 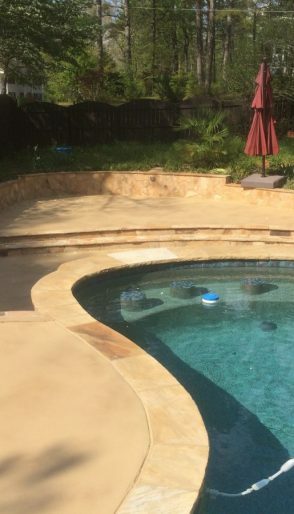 We understand that superior products are essential for durability and beautiful results. We use the highest quality materials to assure a dependable and consistent pallet for our creative design base.